Off-Topic Discussion If you have something to discuss that is not related to the Dodge Nitro, post it in here. Keep it work safe! A pair of champions will team up and carry the Mopar banner in 2016, as back-to-back NHRA Pro Stock champ Erica Enders and five-time overall Pro Stock title winner Jeg Coughlin Jr. will lead the charge for the brand in the popular factory hot rod class. The combination of Elite Motorsports teammates Enders and Coughlin steering fuel-injected, HEMI®-powered Dodge Dart cars puts winners of the past three NHRA Pro Stock World Championships under the Mopar banner. In the NHRA Funny Car class, Mopar and Don Schumacher Racing (DSR) will extend one of the most successful and longest-running partnerships in the sport. Two-time NHRA Funny Car champion Matt Hagan will once again pilot the flagship Mopar Express Lane Dodge Charger R/T Funny Car. Defending and two-time champ Enders, who competed in a Mopar-powered car in 2006-2007, will chase a third consecutive title behind the wheel of her new Mopar Performance Dodge Dart GT NHRA Pro Stock car for Elite Motorsports. Enders didn’t lose a step after breaking through for six wins and her first Pro Stock crown in 2014, stringing together one of the most impressive seasons in Pro Stock history with nine victories, 11 final-round appearances and six No. 1 qualifier spots on her road to the 2015 overall title. A rendering of the new Mopar Performance Dodge Dart GT NHRA Pro Stock Car that Erica Enders will campaign in 2016. The nine wins by Enders, a 32-year-old from Houston, Texas, who now lives in New Orleans with her husband, fellow Pro Stock driver Richie Stevens, broke the single-season mark of victories by a female racer, set by Angelle Sampey in 2001 with seven wins. Enders’ total of 21 career victories ranks 39th on the NHRA all-time win list and just second among women, trailing only Sampey’s 41 wins. Teaming up with Enders in the new Pro Stock era of fuel injection and scoop-free hoods is a driver who has already placed himself among the legends of the sport and who is also no stranger to the Mopar brand. Coughlin clinched his most recent of five Pro Stock championships driving a Mopar-powered Dodge Dart in 2013. Coughlin will man the “Magneti Marelli Offered by Mopar” Elite Motorsports Dodge Dart GT NHRA Pro Stock car in 2016, looking to add even more milestones to a Hall of Fame career that includes 76 victories, with 58 in Pro Stock, good enough for fourth all-time in the class. Coughlin is the first and only driver to score wins in seven NHRA classes (Pro Stock, Comp, Top Dragster, Super Gas, Super Stock, Stock and Super Comp), the only driver in NHRA history to win in four different classes in the same season (1997, Pro Stock, Super Stock, Super Gas, and Comp) and the only driver in the pro ranks to win from every qualifying position, No. 1 to No. 16. “The 2016 season is a turning point for the NHRA and the Pro Stock class,” said Coughlin, a Delaware, Ohio, native who raced a Mopar-powered Pro Stocker in 2005 and 2012-2014. “We’re really looking forward to the upcoming challenges. We are fortunate to have great partners with Mopar and the Magneti Marelli brands, Elite Motorsports, JEGS and Stockseth Racing. It will be a great next chapter in our careers. Mopar will continue to fuel its winning partnership in the NHRA Funny Car class with DSR, one of the elite teams in all motorsports, during the 2016 campaign. Don Schumacher first raced a Mopar-powered Funny Car more than 40 years ago, seizing five wins between 1970 and 1973, and began fielding Mopar-powered Funny Car machines in his role as team owner starting in 2003. In 2016, Matt Hagan will once again helm the Mopar Express Lane Dodge Charger R/T. Working in conjunction with DSR, Mopar debuted a new Dodge Charger R/T Funny Car body in 2015, and the results on the track were nothing less than spectacular. DSR teammates Hagan, Jack Beckman, Ron Capps and Tommy Johnson Jr. combined to place the new body in the final round at all but one of 24 events during the season, amass a total of 15 wins, and place all four Mopar cars in the top five of the standings, with only the overall Funny Car crown eluding the team’s grasp. Beckman also doubled up with wins in the Traxxas Shootout bonus event and prestigious U.S. Nationals during Labor Day weekend. Hagan raced his Mopar Express Lane Dodge to the winner’s circle four times in 2015, adding two runner-up finishes and seizing four No.1 qualifier spots. The two-time NHRA Funny Car World Champion has posted all of the top-five speeds ever run by a Funny Car, and in August recorded the quickest run in Funny Car history at the NHRA Brainerd event. DSR Mopar Dodge Funny Car drivers have won three of the last five championships (Hagan, 2011 & 2014; Beckman, 2012) and teamed to rack up 42 wins over the last five years. Team Mopar will kick off the 2016 NHRA Mello Yello Drag Racing Series season at the NHRA Winternationals, scheduled to take place February 11-14, 2016, at Auto Club Raceway at Pomona, California. Today, Mopar is FCA’s service, parts and customer-care brand and distributes more than 500,000 parts and accessories in over 150 markets around the world. With more than 50 parts distribution centers and 27 customer-contact hubs globally, Mopar integrates service, parts and customer-care operations in order to enhance dealer and customer support worldwide. Mopar is the source for genuine parts and accessories for FCA brands. Mopar parts are engineered together with the same teams that create factory-authorized specifications for FCA vehicles. This offers a direct connection that no other aftermarket parts company can provide. A complete list of Mopar accessories and performance parts is available at Mopar Parts ? Buy Chrysler, Dodge, Jeep, Ram, Fiat Parts & Accessories Online. Mopar will continue its long and successful partnership with Don Schumacher Racing (DSR) in 2016. DSR driver and two-time NHRA Funny Car champ Matt Hagan will again carry the Mopar Express Lane colors on his Dodge Charger R/T. Sergio Marchionne said Monday that it is possible that Alfa Romeo will soon have a team competing in Formula One. "It's incredible how the Alfa Romeo brand remains in people's hearts," said Sergio Marchionne, who is the CEO of Alfa Romeo's parent company FCA and president of Ferrari. "For that reason we are thinking of it returning to Formula one racing as our competitor. "It's important for Alfa Romeo to return. It will be another competitor". Alfa Romeo were involved in Formula One from 1950 to 1985 and they also continued to supply engines to teams until 1988. The team won 11 of the 110 races it took part in and took the 1950 and 1951 drivers' world championships with Nino Farina and Juan Manuel Fangio respectively. The No. 93 ViperExchange.com Riley Motorsports Dodge Viper GT3-R team will defend its 2015 GT Daytona (GTD) class victory in next month’s Rolex 24 At Daytona with team principal Ben Keating and recently crowned Trans Am Champion Gar Robinson the first two drivers named to the entry in the 54th running of twice-around-the-clock race at Daytona International Speedway. Keating, who will pull double-duty in the Rolex 24 in the No. 93 and No. 33 Viper GT3-Rs for the second-consecutive year, was part of this year’s winning driver lineup at Daytona. He co-drove the No. 93 to the GTD victory with Dominik Farnbacher, Kuno Wittmer, Cameron Lawrence and Al Carter and later in the season raced his primary No. 33 ViperExchange.com entry to a pair of wins at Road America and Circuit of The Americas with Jeroen Bleekemolen. Keating’s three race wins were more than any other driver in the 2015 GTD season. Robinson, who turns 21 on Jan. 17, joins ViperExchange.com following a breakout season in Trans Am that saw him win the TA2 championship, Rookie of The Year and three races at Mid-Ohio, NOLA Motorsports Park and last month’s finale at Daytona. He is the son of race-winning sports car road racing driver George Robinson who has a long and established history with Riley Motorsports and Riley Technologies. Among the drivers Robinson edged for his Trans Am championship was Lawrence, who came to Daytona with ViperExchange.com this year as the two-time and then reigning TA2 champion and left a winner in his Rolex 24 debut. Lawrence, Carter and the No. 93 team went on to win the 2015 Tequila Patrón North American Endurance Cup (NAEC), picking up another victory at Watkins Glen in June. Both Texas natives, Keating lives nearby ViperExchange.com headquarters in Tomball while Robinson and his family are longtime residents of San Antonio. Tackling the Rolex 24 with two entries is always Riley’s preferred approach. In this year’s race, the No. 33 Viper was just as competitive as the winning No. 93 entry before dropping from contention with a crank sensor issue while leading early Sunday morning. With the Holiday season in full swing and the annual Roar Before the Rolex 24 At Daytona test just three weeks away, Riley and the ViperExchange.com team are planning on Robinson taking his first laps in the No. 93 during that January 8 to 10 event at Daytona International Speedway. Five-time Pro Stock champion Jeg Coughlin Jr.'s brand new Magneti Marelli/JEGS Dodge Dart is just about finished at RJ Racecars in Galesburg, Ill., which is allowing NHRA fans the first peek at what the new electronic fuel injection configuration will look like in the year ahead. "It's a pretty dramatic change to see the hood of a Pro Stock car without that big hood scoop we've had for so many years but it sure is a slick looking design," Coughlin said. "Then you get a look under the hood and see the intakes and how it all attaches to the top of the motor and you really start understanding that we're in a brand new era. "Personally, I can't wait to drive this thing. I know all the fellas at Elite Motorsports have been going 'round the clock to figure out how we're going to run these cars and I know everyone is the class will be on a huge learning curve but it'll be fun." Rick Jones of RJ Racecars, who tunes back-to-back world champion Erica Enders when he's not building cars, also is close to finishing Enders' Elite Motorsports/Mopar Dodge Dart. The group plans to test both racecars as soon as possible. Here's a good look at the K&N ductwork that will channel air into the fuel-injection system. Air enters through a pair of openings in the car's front fascia (below). The maximum size of the openings is 80 square inches. Trio joins Ben Keating and Gar Robinson on “Team Texas” as No. 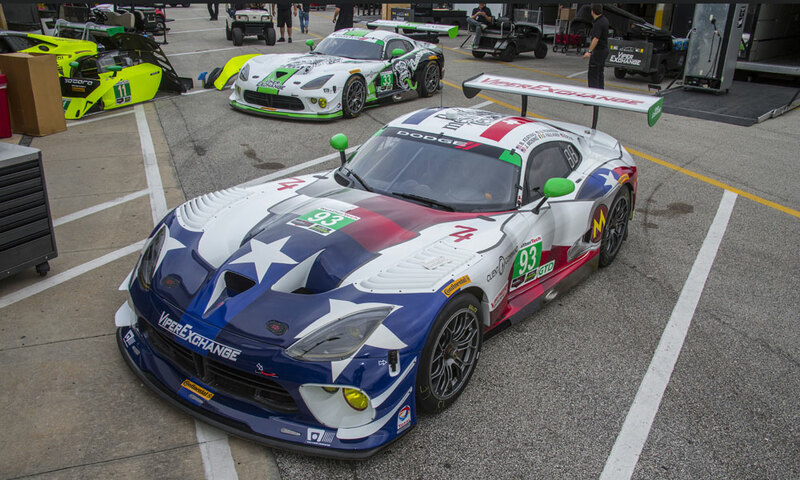 93 ViperExchange.com Riley Motorsports entry prepares to defend 2015 Rolex 24 GTD victory. Tomball, Texas – Jeff Mosing, Eric Foss and Damien Faulkner will complete the driver lineup in the No. 93 ViperExchange.com Riley Motorsports Dodge Viper GT3-R in next month’s Rolex 24 At Daytona where the trio will join previously announced drivers Ben Keating and Gar Robinson and the team in defending this year’s GT Daytona (GTD) class victory. A pair of Dodge Viper GT3-R race cars competes in the Rolex 24 at Daytona this weekend, fielded by private owner Ben Keating. Twenty-four continuous hours of turns, hard braking, wide open throttle, pit stops and driver changes – that’s the exciting and challenging way to kick the racing season into gear. It’s the place where you’d expect to find the Dodge Viper. In fact, you’ll find two Viper GT3-R race cars among the more than 50 sports cars and prototypes ripping around the high-banked turns and infield road course of Daytona International Speedway this weekend for the Rolex 24. The No. 33 and No. 93 Vipers are fielded by private team owner Ben Keating, who is also owner of Tomball Chrysler-Dodge-Jeep-Ram in Tomball, Texas, and the ViperExchange.com web site. Keating does more than write the checks, he’s on the driver team for each car. He’s also the defending champion in the GT Daytona class for the Rolex 24 at Daytona in the No. 93 car. This is the third year Keating has run the Viper GT3-R in the Daytona event. If he has an edge for the race, it would be his familiarity with the track and the equipment. Yet the cars, prepped by Riley Technologies, face challenges. Rules changes for 2016 called for cars in the GT Daytona class to be configured to international GT3 standards. Major changes include a near rear differential and shocks, as well as the addition of traction control and anti-lock brakes. It won’t be easy to miss the Vipers on the Daytona track. The No. 33 car carries sponsorship and the distinctive logo of fellow Texan Richard Rawlings and his Gas Monkey Garage. The No. 99 car mimics the look of the Texas state flag, along with “Don’t Mess With Texas” on the roof. The driver lineup is also a mix of old and new. In the No. 33 car, Keating teams with Dominik Farnbacher, Jeroen Bleekemolen and Marc Miller. Farnbacher was part of the winning No. 93 team a year ago and Bleekemolen was part of the driving crew for the No. 33 car that finished 9th in the GT Daytona class. The No. 93 driver lineup this year is Jeff Mosing, Damien Faulkner, Eric Foss and defending Trans Am TA2 champion Gar Robinson. The GT Daytona class is the largest among the four competing in the Rolex 24 with 22 cars. The Viper GT3-Rs will battle cars from Aston Martin, Audi, BMW, Ferrari, Lamborghini and Porsche. We hope to see a Viper GT3-R team back on the top step of the podium on Sunday afternoon. Fox Sports will broadcast much of the Rolex 24 at Daytona on the Fox Sports 1 and Fox Sports 2 networks. Overnight racing will stream on the Internet at WeatherTech SportsCar Championship | International Motor Sports Association. On the Internet, race information, including real-time timing and scoring, can be found at WeatherTech SportsCar Championship | International Motor Sports Association. After 24 hours circling the track at Daytona International Speedway, both Dodge Viper GT3-R race cars fielded by team owner Ben Keating and Riley Motorsports finished in the top 10 of the GT Daytona class. The drivers of the No. 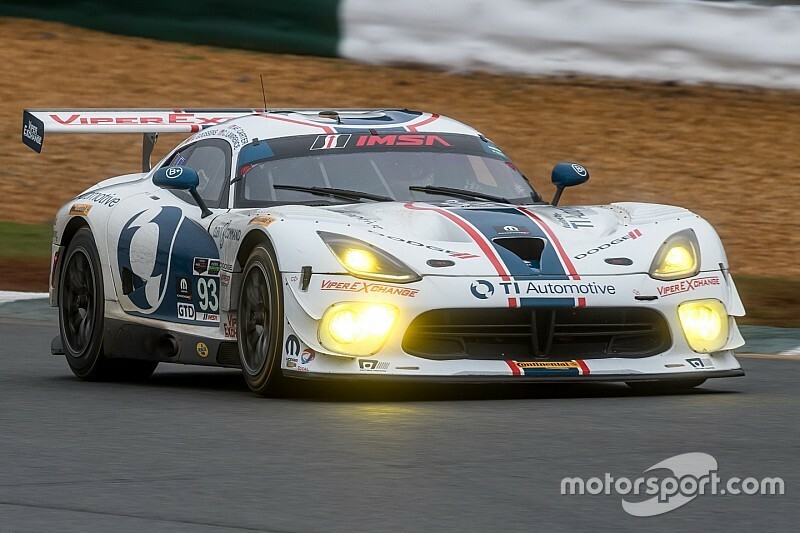 93 Viper stood on the GTD podium with a third-place finish. "I'm extremely proud of our team. We had lots of challenges and obstacles this whole weekend with both cars," Keating said after the race ended Sunday afternoon. -- The No. 93 car completed 703 laps in 24 hours. That's 2,502.68 miles. It made 28 pit stops. At the end, it trailed the lead car in the GTD class by 5 seconds. The car, with driver Damien Faulkner at the wheel, moved from 6th place to 3rd place in the GTD class during the last hour of the race. -- The No. 33 car, which finished 10th in the GTD class (out of 22 cars), completed 700 laps for 2,492 miles. At race end it was three laps behind the GTD leader. The car fell behind the pace overnight when crashed into a tire barrier with Keating at the wheel. The field completed 5 laps before the Viper made it back to the garage for repairs. Five laps later it was back on track with new tires, wheels, brakes, bumpers, hood, door and rear quarter panel. Keating and his ViperExchange.com cars get back on track at Sebring International Raceway for a 12-hour race on March 19. The No. 93 Dodge Viper GT3-R placed third in the GT Daytona class during the Rolex 24-hour race at Daytona International Speedway. A pit stop -- one of 28 -- for the No. 93 Dodge Viper GT3-R during the Rolex 24-hour race at Daytona International Speedway. A pit stop for the No. 33 Dodge Viper GT3-R -- one of 27 it made during the Rolex 24-hour race at Daytona International Speedway. The driver crew for the third-place No. 93 Dodge Viper GT3-R in GT Daytona: Damien Faulkner, Eric Foss, Jeff Mosing, Ben Keating and Gar Robinson. NHRA Mello Yello Pro Stock world champion Erica Enders completed a successful first test with her new Elite Motorsports Mopar Dodge Dart, and the first full day of testing could not have gone any better. "I was really impressed," Enders said. "It was a pretty awesome experience. I feel like my expectations were a little tainted by what other people had reported about EFI and I didn't know what to expect, but then to experience it firsthand with my guys, I'm very optimistic. Things went well, and I'm excited about the season. "We accomplished a lot in one day, and we did that because of the preparation and hard work of all my Elite guys." Enders drove her new Dodge through a full day of testing, learning many of the differences between the former Pro Stock configuration and the new one. "The drivability is absolutely different," Enders said. "It's definitely challenging, but change always is. I couldn't have asked for a better first experience with it. We had a great track to test on, and with a brand-new race car and all the new EFI stuff, we went out and went right down the racetrack -- no blips, no hiccups, nothing. It was great." Enders didn't notice much of a change with the removal of the hood scoop on the new car, made necessary because of the elimination of carburetors. "I've never raced with an open windshield like that," Enders said. "I've always had a hood scoop or a blower or something, so it was definitely different to have a wide-open view. That was a big change, but I ignored that aspect of it because I was so focused on doing my best in the race car. That wasn't even a thought." Enders and her Elite Motorsports team continue preparation for the 2016 NHRA Mello Yello Drag Racing Series season with testing at Wild Horse Pass Motorsports Park in Phoenix starting next Sunday. Series under new title sponsorship for 2016 with Pinty’s Delicious Foods Inc.
Mopar, FCA Canada’s service, parts and customer-care brand, is proud to announce that Canadian Andrew Ranger will again be behind the wheel of the Mopar racing car when the green flag flies for the upcoming 2016 season of the NASCAR Pinty’s Series (formerly NASCAR Canadian Tire Series presented by Mobil 1) beginning May 22. Ranger is no stranger to Canada’s NASCAR Series circuit. At age 29, he’s already won the championship twice (2007 and 2009; the same year he was named ‘Most Popular Driver’ by fans). In the past two years, he has three wins and four poles. Ranger finished last year third in the points standing and has tied rival driver Scott Steckly for the most wins in the Series at 20. The Roxton Pond, Quebec-native has a new crew chief for 2016 in David Wight; his No.27 racecar gets an exciting new Mopar paint scheme and the car will again be built by the top-notch team of DJ Kennington, a two-time Series champion himself. The 12-event, Canada-only stock car racing series has a new title sponsor for 2016 in Pinty’s Delicious Foods Inc. Its sponsorship announcement came alongside news of a three-year deal for the Series to run again at the Indy Toronto weekend in July. The Series raced Toronto in 2010 and 2011, with Ranger winning both of those events. Mopar is synonymous with racing and the storied brand has been ingrained in Canada’s motorsports scene for decades. It has been a major part of the NASCAR Series since its inception, all the way back to the CASCAR Series. In 2015, a Dodge-branded car won more than half of the 11 Series races and Scott Steckly - in the Canadian Tire Dodge - won the championship. Mopar is also the title sponsor of the Canadian Superbike Championship and sponsor of the two largest IHRA Drag Race events in North America: the Mopar Rocky Mountain Nitro Jam Nationals in Edmonton, Alberta and the Mopar Nitro Jam Nationals at Grand Bend, Ontario. Today, Mopar is FCA’s service, parts and customer-care brand and distributes more than 500,000 parts and accessories in over 150 markets around the world. With more than 50 parts distribution centres and 27 customer-contact hubs globally, Mopar integrates service, parts and customer-care operations in order to enhance dealer and customer support worldwide. Mopar is the source for genuine parts and accessories for FCA brands.